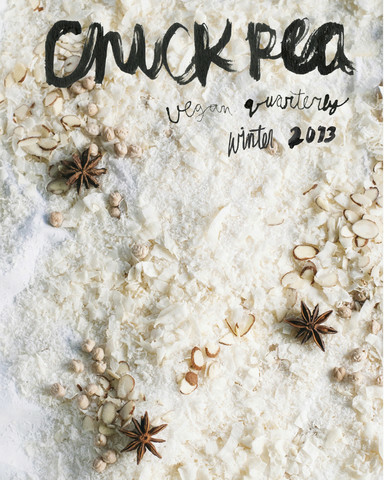 My second article has come out in Chickpea Magazine. It is called “In Season: Butternut Squash” and it features three recipes made with, you guessed it, butternut squash! This light orange hourglass-shaped fruit, which everyone calls a vegetable, is sweet, nutty, and full of fiber, vitamins A and C, minerals, phytonutrients, and carotenoids. That means it is really good for you! Even better, butternut squash is very versatile. It can be made savory paired with rosemary or sweet when sprinkled with maple syrup and cinnamon. It can be roasted to adorn a holiday buffet or puréed to make soup. But, it can be also be used as a secret ingredient in pancakes and chocolate mousse! This squash can look intimidating, the sort of thing you pass by at the market. But once you get the hang of it, you will be so excited by this gift of the fall harvest! Here is how to prepare a butternut squash for roasting and puréeing. You will need a sharp knife, a sharp vegetable peeler, a big spoon, and a cutting board that doesn’t slide on the counter. Step 1: Slice the butternut squash in half from top to bottom. Step 2: Scoop out the seeds and membranes. Step 3: Cut off the very top and very bottom. Step 4: Use a vegetable peeler to remove the skin. Step 5: Cut the squash into small cubes. Step 6A: Roasting – toss the cubed squash with a tablespoon of olive oil and bake in a 400 oven for 25 to 30 minutes. Step 6B: Puréeing – place the cubed squash in pot and cover with water. Bring to a boil and then reduce to a simmer. Cook for 15 minutes until soft. Use a potato masher to purée the squash. Here are four recipes to get you through an entire day – from breakfast to dessert – using this great veggie-fruit. Whisk the ground flax and water in a small bowl and set aside. Mash the banana in a separate small bowl and set aside. Place the flour into a big mixing bowl. Add the baking powder, cinnamon, nutmeg and salt. Mix together with a fork. Add the oat milk, squash, banana, flax egg, vanilla and maple syrup. Mix together with a wooden spoon until the batter comes together. Heat a nonstick skillet. Using a tablespoon measure, scoop up the batter and drop it onto the skillet, 4 to 6 at a time, depending on the size of your skillet. Don’t let them touch! When the top of the pancakes are bubbly, flip them over with a spatula. Cook the second side for a minute. Serve hot topped with maple syrup. Note: This batter keeps in the refrigerator for up to a week. Make some pancakes today and save the rest for tomorrow! Chop the onions and red peppers into a small dice. Mince the garlic and chop the cilantro. Cook the onions, in water or oil, and cook until they become translucent. Add the garlic and red peppers and cook for five more minutes. Place the squash, beans, and quinoa into a big bowl. Add the onions, red pepper, garlic, cilantro, cumin and salt. Mix well. Reserve 1/2 cup of the mixture. Place the rest into the food processor and process until combined. Add them back together and mix well. Form 6 burgers and place on a baking sheet. Bake in a 350 oven for 30 minutes. Slice the red onions, keeping the sections together. Place the buns under the broiler for 3 minutes. To serve, place the burger on the bottom side of the bun and the lettuce and onions on the top. Note: Leftover cooked burgers freeze well. Wrap each one individually and store in the freezer. When ready to use, defrost the burger and heat in a skillet brushed with oil until both sides are crispy or bake in a 350 oven for 30 minutes. Make the cream sauce by placing the roasted butternut squash, beans, 1 1/2 cups of vegetable stock and a pinch of salt into the food processor. Process until completely smooth. Pour into a fine mesh sieve, over a bowl, pressing the sauce through with the back of a spoon. Set aside. Chop the walnuts and place on a baking sheet. Toast in a 350 oven for 7 to 10 minutes until fragrant. Check them to make sure they don’t burn! Slice the shallots thinly. Heat 1/4 cup vegetable stock in a big pan. Add the shallots and cook on medium heat until the shallots become translucent. Add the spinach and toss with tongs until wilted. Bring a big pot of water to boil. Drop the pasta in and cook until al dente. Drain and return back into the pot. Add the shallot and spinach mixture and the cream sauce. Use tongs to toss everything together. Season with salt, to taste. To serve, place the pasta into a big bowl and top with walnuts. * If you do not have a Vitamix or other high-speed blender, soak the cashews for at least 4 hours. To make the mousse, place the squash, cacao powder, banana, sugar, oat milk, vanilla, and salt into the food processor and process until completely smooth. Refrigerate. To make the crème, place the cashews, water, sugar, vanilla, and salt into the blender and blend until completely smooth. Refrigerate. Spoon the mousse and crème into separate pastry bags. If you don’t have pastry bags, no worries! Spoon the mousse and crème into separate Ziploc bags and cut a small hole at one corner. Pipe the mousse into the bottom of a parfait cup about 1/4 the way up. Next, pipe in a small layer of crème. Continue to alternate mousse and crème until the cups are just full, finishing with a layer of crème. Note: Store any leftover mousse and crème in the refrigerator for up to a week. Book Report: Isa Does It! the spreads look beautiful! congratulations!